Regular Density is suitable for light use and decorative applications. SPECIAL CUT FOR SEATING (CHAIRS, COUCHES, SOFA). 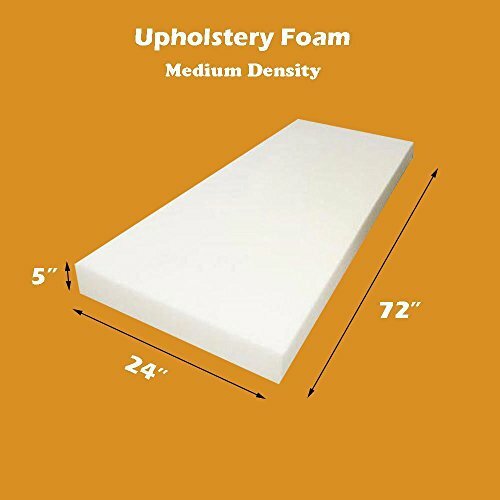 It features the perfect amount of stiffness for Chairs, Seats, And Coaches.This 2" upholstery foam (size 2"x26"x26") offers an additional layer of support for chair cushions or seat covers. Upholstering a window seat cushion using " upholstery foam creates an inviting and comfortable spot to curl up with a cup of tea and enjoy the view. Size:2"ThickX26"WideX26"Long Density:1.4 Technical Bulletin CA 117-2013 Flammability Standard Compliant Very Good Quality Retardant 33lb Compression COMPRESSION = FIRMNESS Compression (not density) is what determines firmness. If you don't want a cushion that's hard as a rock or a mattress that sinks when you sit on it, you have to check the compression or ILD number. Compression means the number of pounds necessary to compress a piece of foam 25% and still bounce back to the original thickness. For example, a 4" thick piece of foam that requires 35 lbs. to pack it down 1" and have it return to its full 4" thickness has a 35 lb. compression rating or ILD -Indention Load Deflection. Uses : Ideal for oval and round poker tables, furniture cushions, boat cushions, car cushions, foam mattresses, bedding support, and all other home and commercial upholstery applications. FOAM PACKAGES NEED TO BE OPENED IMMEDIATELY ONCE YOU RECEIVE THE PACKAGE. DO NOT LET THE FOAM SIT UNOPENED FOR MORE THAN 1 WEEK! DO NOT OPEN WITH A BOX CUTTER! USE A BALL POINT PEN OR A PENCIL. START BY MAKING A LITTLE INCISION AND BREAK IT FROM THERE. Foam can be cut to the size that you need with a sharp carving knife or electric knife. We also do Pre-cut foams on your desired measurements. Just e-mail us after you purchase the foams so that we can cut it and ship it to you. Durability : Will Last 7 to 10 Years Care Instructions : When unpacking, allow at least 2 days for the foam to breathe in order to recover its original size and form.